Japanese-American identity and art in post World War II American society. It's easy for us to think of the world as drawers in a shelf; people and ideas are given designated areas like how our tees and socks are kept separate. In reality we are influenced by our family, our race, our upbringing, our inspirations, and our studies. Ruth Asawa was a Japanese-American artist who grew up in America during World War II and was affected by Executive Order 9066, which detained all residents of America of Japanese ancestry, even American-born Japanese, in internment camps. It was in these camps where she found art by befriending artists that worked for Walt Disney. She later enrolled in Milwaukee State Teachers College but was unable to get her degree due to the simmering resentment of Japanese Americans after World War II. In 1946, Asawa began to study at Black Mountain College in North Carolina, learning from great icons of the 20th century like Josef Albers, Buckminster Fuller, and Merce Cunningham. It was at Black Mountain that Asawa began to explore wire as a medium, inspired by a 1947 trip to Mexico during which local craftsmen taught her how to loop baskets out of this material. The David Zwirner Gallery is impeccable in their curation and their design of the space to accommodate the works of artists they feature. Ruth Asawa's work was on the second floor of the gallery, while Ad Reinhardt's pieces were beautifully curated on the first floor. Two of the smaller rooms featured her illustrations along with photographs and articles of her. The main room of the second floor was where Asawa's collection of wired sculptures was showcased. Her sculptures were simple in design but complex in construction. It's easy to see the painstaking effort to create these beautiful wired sculptures, but what blew me away was the way the sculptures conversed with each other within the space. 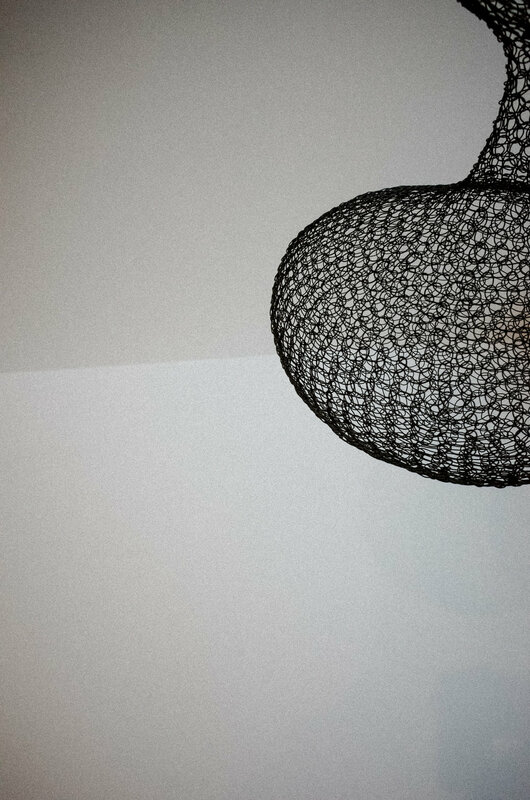 Some were tall and complex, with wired sculptures nested inside each other like Russian dolls. Some were conical while some looked like drips of oil in water. There were small ones that hung high, with others that resembled a snowflake. As you stand in a corner of the main room it felt like viewing a school of jellyfish in an aquarium. As you walk up to the sculpture and make your way through the room you imagine that these shapes came from an image taken by the Hubble Space Telescope. The bulges and elongated bodies of these sculptures reminded me of the Pillars of Creation or an eery cosmic body floating in space. 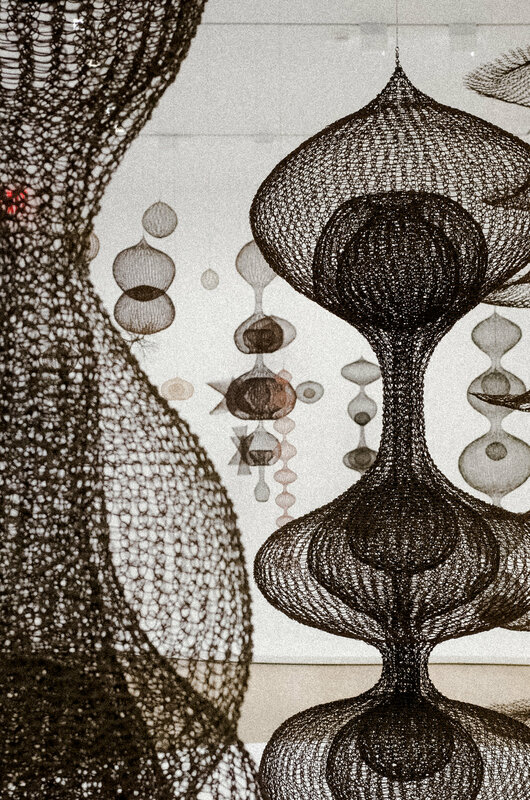 Ruth Asawa's early life of being raised in internment camps is a unique vignette in American art. But I believe there were many like her, Japanese-American artists and creatives who struggled during World War II American society. The story of Japanese residents of America during World War II is often overlooked by our victory in the war. There is great irony while learning about this particular slice of American history. America was fearful of the Japanese population in the country turning their backs, so in turn they created internment camps to prevent them from plotting any acts to stop the Allies from winning the war. Although Executive Order 9066 was a bruise in American history we should always be mindful of the faults we've made and learn from them. 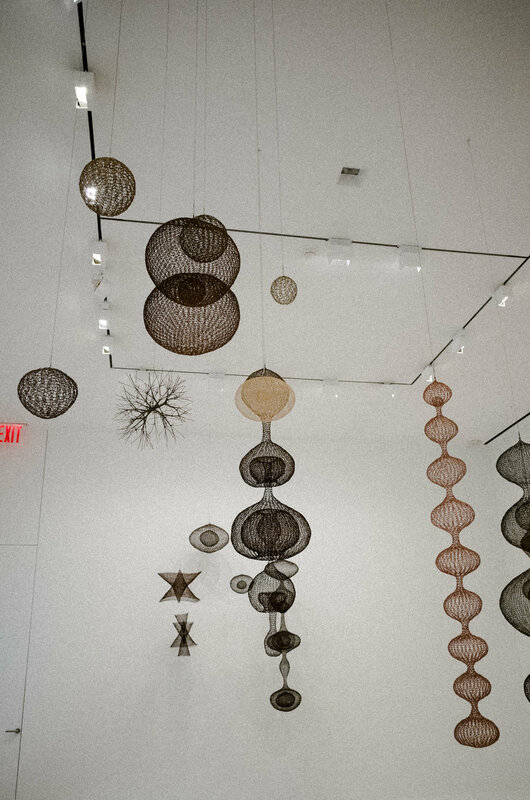 Ruth Asawa is a testament to the beauty and craftsmanship of Japanese-American art that persisted during a time when the country they called home was still trying to overcome that they were not enemies. Asawa has also contributed tremendously to art education programs for children. She mobilized hundreds of schoolchildren to help create the Ghirardelli Square Fountain in San Fransisco. She believed in hands-on experience for children exploring art and followed the approach of 'learning by doing,' modeled by her growing up in the farm. Her mission to make art accessible to children and to the public have made her become part of the the California Arts Council, National Endowment of the Arts, and also a trustee of the Fine Arts Museum of San Francisco. The exhibit is a wonderful introduction to her personal works leaving you eager to learn more about her career and life.